Road trips have always been a part of my life. When I was growing up vacations were taken in the family car; my dad loved driving out on the open road, my mom would sit in the passenger seat, map in hand guiding him along. On summer days my mom would load my sister and I into the car and take rides in the country; our rides always resulted in an ice cream cone or a root beer at the A&W Drive-In. I did not inherit the driving gene, or the map reading gene, for that matter; but I did marry a man who is happiest behind the wheel. There’s nothing more American than a trunk-load of clothes, bags of goodies, a road atlas, a full tank of gas and a sense of adventure! In the last post we were on our way to Cleveland to visit with friends for a couple of days; we had a great time as always. Now we are making our way back to Detroit. Driving southwest out of Cleveland we are heading to Oberlin, Ohio; Frank Lloyd Wright’s (FLW) Weltzheimer/Johnson house is open for public tours today, we’re gonna check it out. 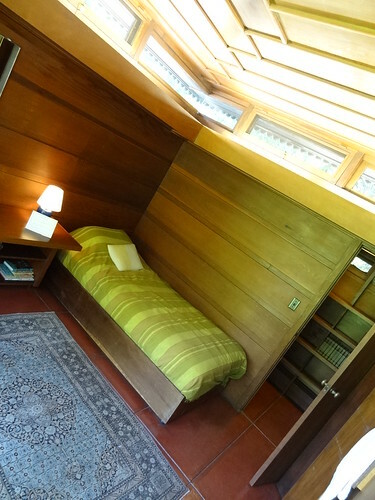 In less than an hour we have arrived in the college town of Oberlin; several blocks from campus we park in front of the first Usonian house in Ohio and one of the few in the country open to the public. 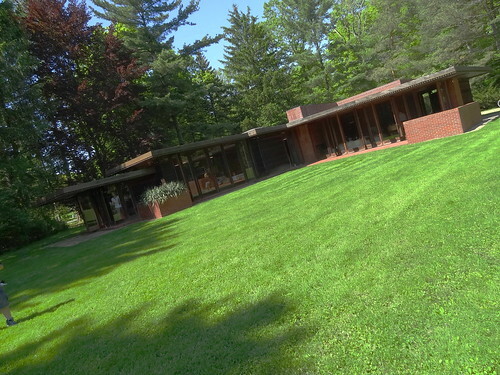 The L-shaped home is set far back from the street on a sprawling, green lawn. Designed in 1947, completed in 1949 the building is constructed of brick, masonry, and redwood, the house sits low on the horizon; a flat roof and cantilevered car port give it a distinctly modern feel. As we get closer we notice the hundreds of stained croquet balls that form the roof dentil ornamentation; the circular motif is carried on throughout the home. 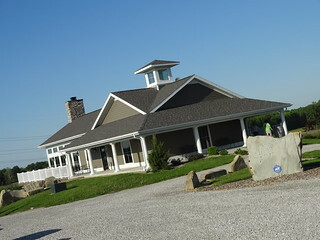 At the side entrance we each pass over $5.00 to gain entry. 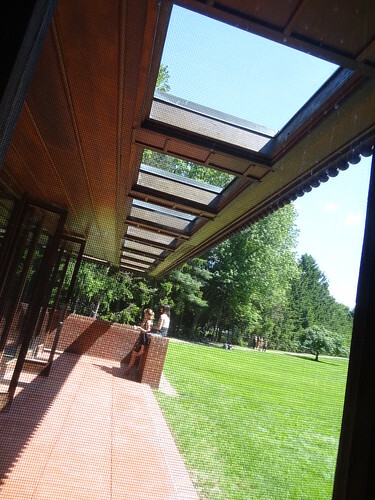 My first impression of the interior is that it is long and narrow, in typical Wright fashion, tight spaces lead into grand ones; here we are led into the family room, a large, open, but cozy area. Floors are stained concrete slab throughout, furniture is built in, one wall is floor to ceiling glass, doors open out to the front landscape, a red brick fireplace anchors one side of the room. The ceiling is wood, thin strips of molding add a decorative touch. 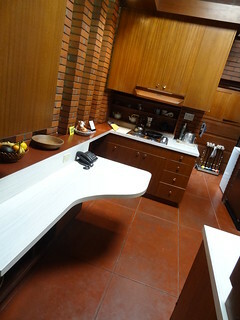 The kitchen is closed in except for an open section between brick columns that separate the work space from the living room. The counters are low, they’d be perfect for someone short, like me, colors are earth-tones, work space is set up in conjunction with the location of sink, fridge and stove. Back in the long hallway, my attention is drawn to the shelves that line the length of the wall, above them clerestory windows are covered with wood panel screens, here the circular motif is once again present. 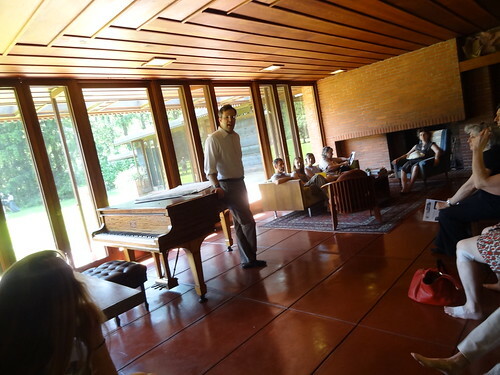 FLW had a way of making a residence feel homey and comfortable; maybe it’s the materials he used, or the colors, whatever it is I always feel like I could just sit down and read a book or have a cup of coffee when I’m in one of his houses. Kris is well ahead of me, there is nobody else down at the far end of the house, he can get some good shots of the rooms. There are 4 bedrooms; beds and desks are built-in, the master has a bathroom en-suite, along with a fireplace just like the one in the family room. Interior walls are horizontal wood pieces, the exterior wall is glass with a door that opens out to the common space. 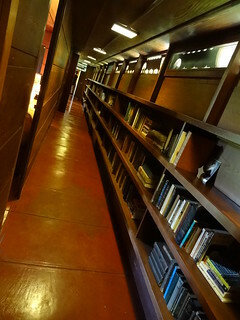 Again we find colors of brown, gold, rust and bittersweet; floors have radiant heat to keep the home warm. The original family lived here until 1963, at one time developers “remodeled” the home, they painted the entire interior white–gasp!! 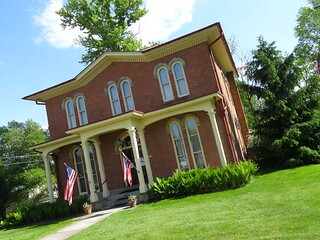 In 1968 Art History Professor Ellen Johnson purchased and restored the house, she died in 1992, leaving the house to Oberlin College to serve as a guesthouse for the Art Department and Art Museum; it’s wonderful the house remains open to the public. Ok, enough of that, we’re hungry, time to head downtown…. It is Commencement weekend at Oberlin College, people are everywhere; Kris sees and open parking space and grabs it, Tree Huggers Cafe is right across the street, perfect, let’s have lunch. 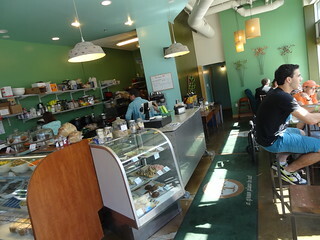 The little cafe is just below street level, windows look up and out to the sidewalk. Refrigerated cases hold bowls filled with varieties of cold salads, entrée’s and desserts. Standing at the counter we read the list of today’s specials, place our order then have a seat—it feels good to sit down. 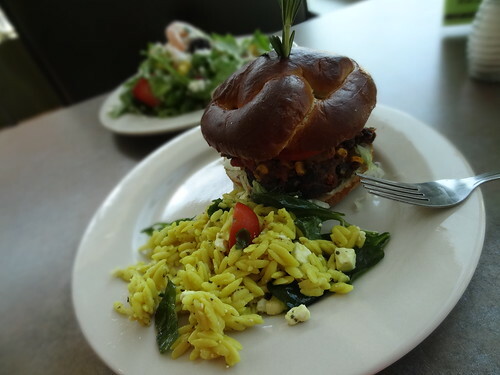 In no time at all a server brings us a black bean burger with a nice-size helping of orzo salad and a green salad topped with chilled shrimp, goat cheese and berries. The restaurant serves organic, vegan and vegetarian selections; seafood is wild-caught, produce is local, I can tell you, everything was delicious! 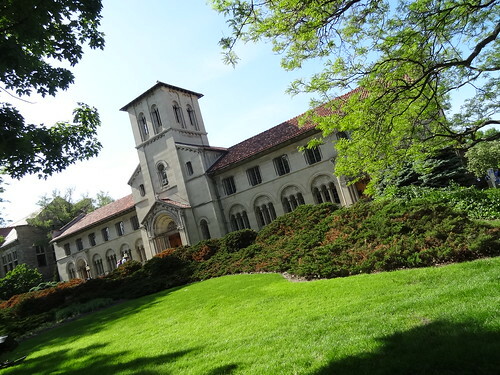 Oberlin itself was the birthplace of the modern aluminum refining process that made the metal economic for industrial use, the city was Station #99 on the Underground Railroad. 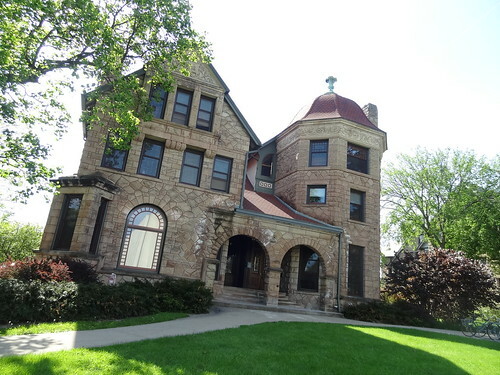 The college was the first American Institute of Higher Learning to regularly admit African-American and female students in addition to white males, the first African-American graduated in 1844; this was also the home of the first co-ed dorm in the US (1970). 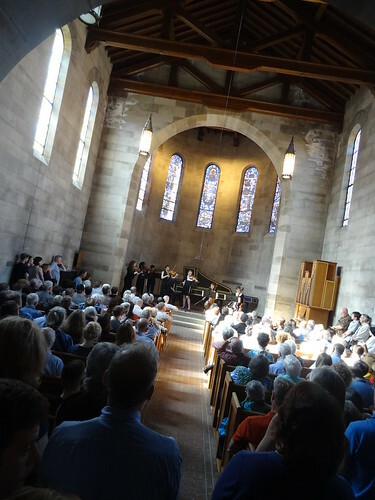 39 buildings in Oberlin are designated as “Oberlin Historic Landmarks”, 20 of those are also on the National Register Of Historic Places; an interesting place, no doubt! 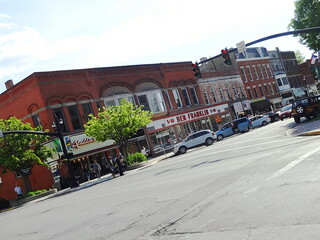 The busy downtown runs several blocks; it looks like Main Street USA, very cute and tree-lined.We begin our walk around the picture-postcard-looking campus; architecture is a mix of old and new, plain and fancy, it’s all gorgeous. One building, the Allen Memorial Art Museum, with its multiple arches, has a familiarity to it—turns out it was designed by Cass Gilbert (Detroit Public Library). 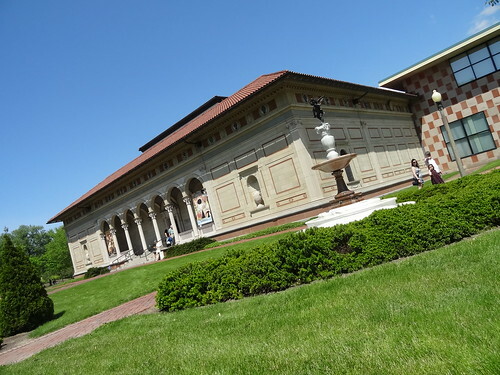 Built in the Italian Renaissance style, the museum is said to be one of the five best college and university art museums in the nation, let’s go in. 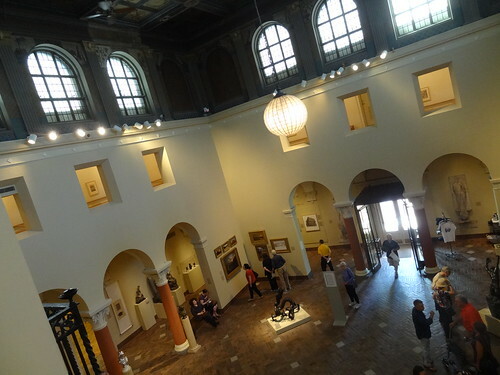 The main gallery is an open space, sunlight streams in through the windows, the ceiling is coffered and dark, archways on both sides lead to narrow halls. 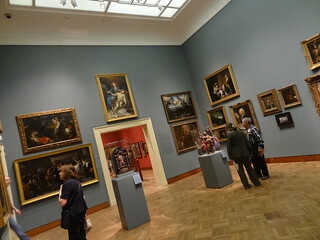 The Gilbert Galleries house the Old Master’s and 19th Century paintings, sculpture and decorative arts. 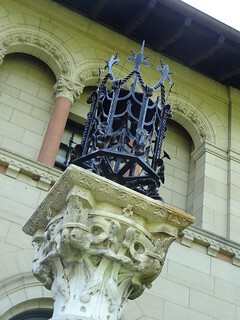 On the second level, two Juliet balconies jut out from opposing walls, giving visitors an overall view. 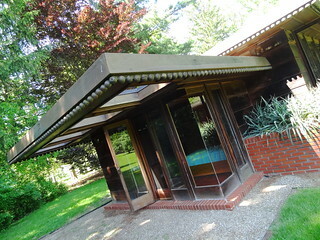 In 1977 an addition was built to house Modern and Contemporary Art; they have some great whimsical pieces. 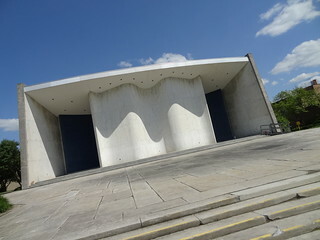 Right next door is Hall Auditorium, a cool modern-looking structure designed by Wallace Harrison in 1953. 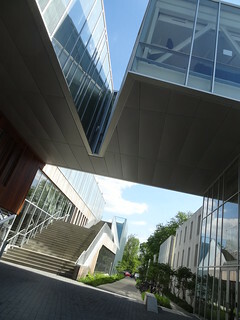 Buildings on campus were built from 1887 to well into the 1970’s. 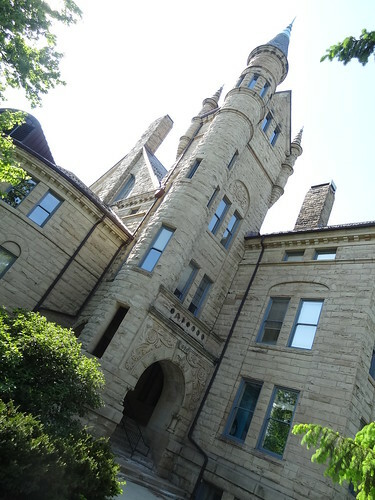 We walk along past solid structures, thick and chunky looking they are made of textured buff Ohio Sandstone, they resemble the Romanesque style. In some, the doors are unlocked, giving us the opportunity to check out the insides; beautiful wood, antique chandeliers and fireplaces are not uncommon. 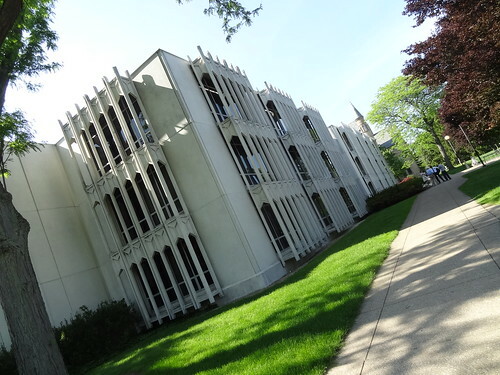 To our surprise there are 3 Yamasaki buildings on campus, including the Conservatory of Music (1964); they all feature the signature Yamasaki concrete grates that cover the windows, one reminds me a bit of the Gothic style, these were all done before the World Trade Center. Definitely a walking campus, there is a serenity and calmness to the overall design; it’s interesting to walk past a 1963 Yamasaki building next door to something constructed in the late 1800’s. There’s another Gilbert building that looks like a miniature version of our library, the Carnegie Library was built in 1908. 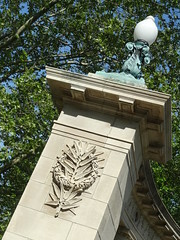 There are great wooden doors, fabulous torchiers, pretty lamposts, turrets and spires, we walked until we could walk no more! We are still a few hours from home, time to continue our journey west. 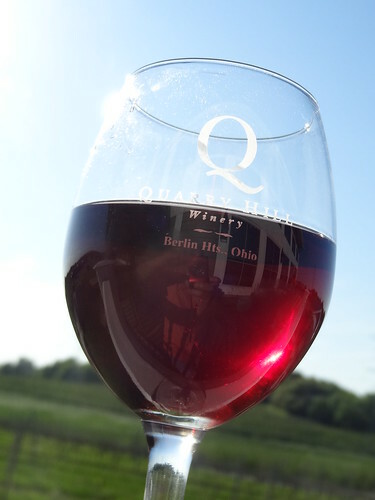 Kris has a great route he knows by heart, lucky for us, it takes us right near the Quarry Hill Winery in Berlin Hts Ohio. Kris grabs a table while I get the wine; I join him at a table on the deck overlooking the orchards; sipping our blueberry wine we relax until dusk, time to go home.